Pyretic Productions has once again travelled to Ukraine. 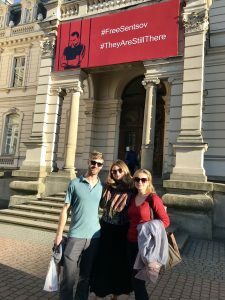 The first time was for a research trip to gather information and sentiments about the ongoing war in Eastern Ukraine. 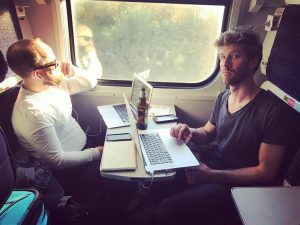 You can read about that journey here. 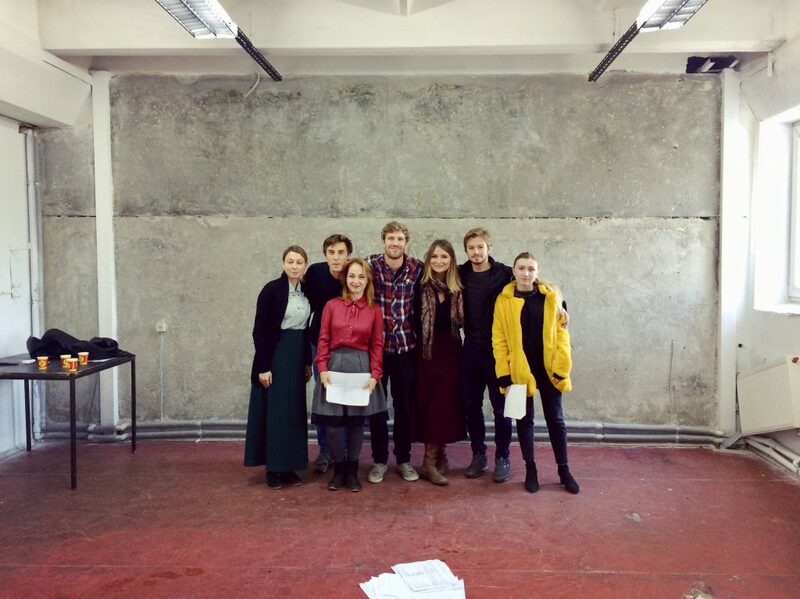 Throughout the month of October, we continued the development of Blood of Our Soil by Lianna Makuch with Kyiv based theatre company, Дикий Театр (Wild Theatre). Working with a company of actors, we workshopped the script and then presented it to a small group of veterans and local artists. To conclude the process we offered a public performance at the Центр Леся Курбаса, The Les Kurbas Centre, in Kyiv on October 17. The first day we met the actors, read the play, discussed the content of the story, and explored areas in the script that required further attention. 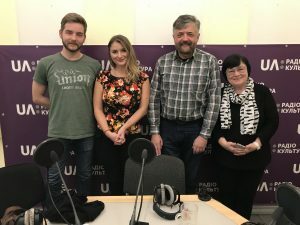 The actors shared how the Ukrainian identity has changed following the Revolution of Dignity, and then described what life is like trying to live a normal life knowing a war is occurring in their country. They remarked how close the content feels to them and that they do not have to extend their imagination to empathize with their characters. 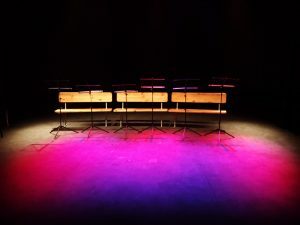 We examined the role of theatre and art in our countries, and how it is used to share and evoke our collective stories. The second day, Playwright Lianna Makuch and Dramaturge Matthew MacKenzie got to work on a new draft of the play while, Director Patrick Lundeen spent the day working closely with the Ukrainian actors, discovering their characters and offering guidance on performing and speaking in English. Luckily two of the cast members were quite comfortable with the English language and could translate some of Patrick’s more complex thoughts and directions. 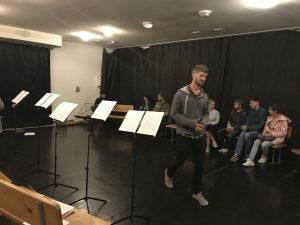 The third day saw a new draft of the play which was motivated by our own creative team’s goals as well as the feedback from the Ukrainian actors. Ukrainian ATO volunteer veteran Dmytro Lavrenchuk and photojournalist/American veteran of Iraq and Afghanistan, Jenn Blatty, joined us as we read the second act of the play aloud twice. We were grateful for their informed feedback and questions. On the final day of our rehearsal week we once again divided forces. 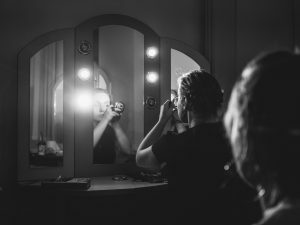 Matthew and Lianna worked in the morning to create stronger transitions and bridges between scenes, while Patrick played the part of Hania and Director in order to put the second act of the play on its feet. This exercise gave the actors the opportunity to feel the text in their bodies, and permission to embody their characters. Later that day Patrick played Hania again, and allowed Lianna to simply watch and hear her play as the cast presented their freshly staged version of act 2. Following the run-through we heard some of that morning’s rewrites. On a dramaturgical level, we learned how the show flows, and the areas the script that still need further development were revealed. It’s been wonderful to hear and feel the show with native speakers of the Ukrainian and Russian languages. It provides an interesting authenticity to the exchanges between the Ukrainian characters and the Canadian character of Hania. 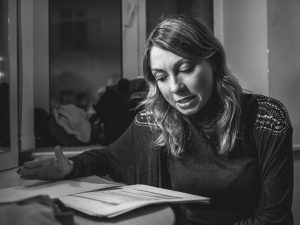 The cast’s perspectives as artists and Ukrainian citizens have deepened our feelings of the play’s subject matter, and have further shaped the direction of this new Canadian play. 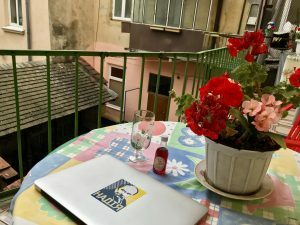 The next week was spent in Lviv writing, rewriting, reading, talking and rewriting. Later we returned to Kyiv to rehearse the final draft, which was read to a closed group of veterans and people affected by the war. And then a public presentation was hared on Wednesday, October 17 at the Les Kurbas Centre. 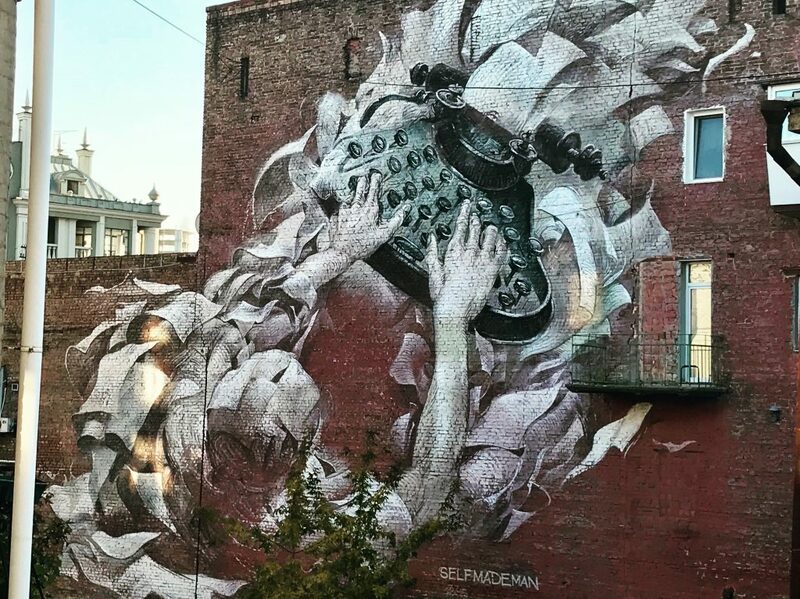 A fitting street mural outside our apartment window in Kyiv. 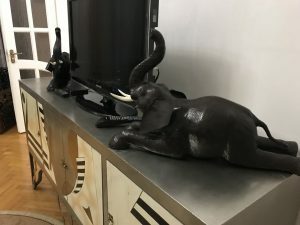 Following the train ride to Lviv from Kyiv, Pyretic Productions settled into a beautiful elephant themed 2-bedroom Airbnb right in the city centre. A tourist hotspot, Lviv boasts some incredible restaurants and cafes and has a cultural flame that rivals the rest of Europe. Our days in Lviv were pretty simple; we hopped from Café to restaurant to bar throughout the 5 days we were there. 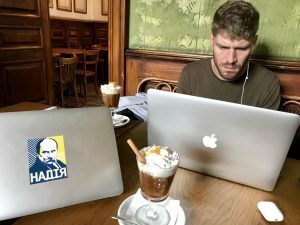 Lviv is a European writing paradise, and it was an incredibly productive time for play development. The team had many creative dramaturgical sessions over the picturesque “Ploshta Rynok,” Market Square, and Lianna spent her days driving the script to its next iteration. 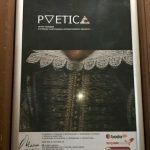 Театр (Malyj Theatre) in a collective creation performance called “Poetica.” Although performed in Russian, it was fascinating to see how ways of communication and performance elements transcend language. 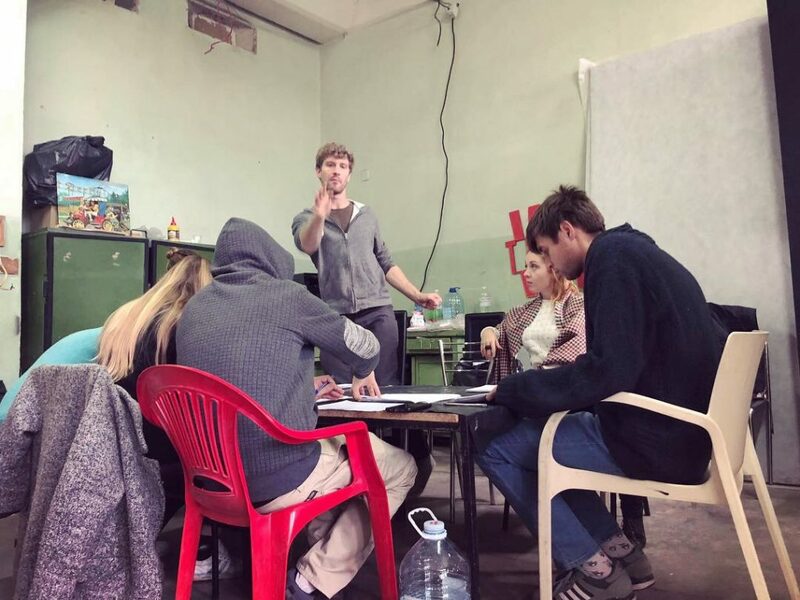 Our first day back in rehearsals in Kyiv, we held an open rehearsal where we shared the new script with a small group of veterans and local artists – a group of about 10 people. The poignant conversation following the read, motivating Lianna’s final push to finish the play. 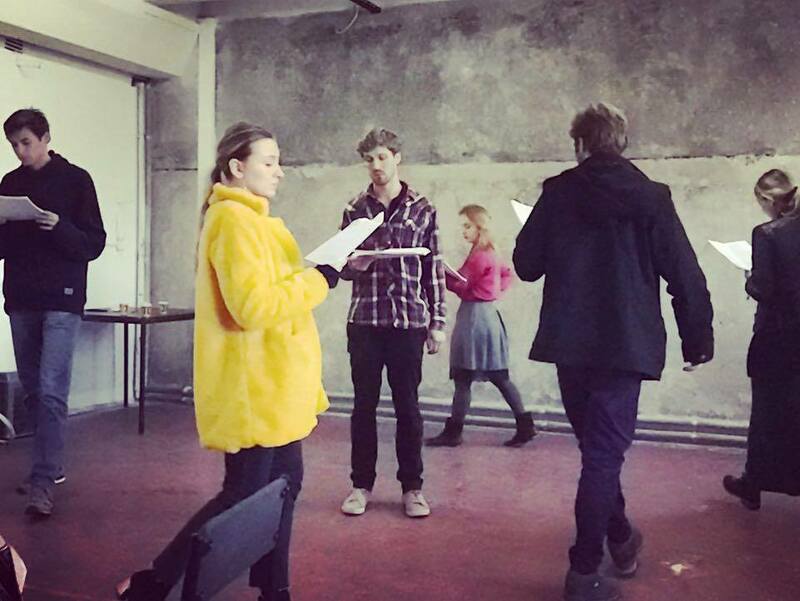 Later that day, Lianna rigorously continued with rewrites as Patrick worked with the actors finding nuances in their characters, and offering direction as we prepared for the public staged reading the following day. 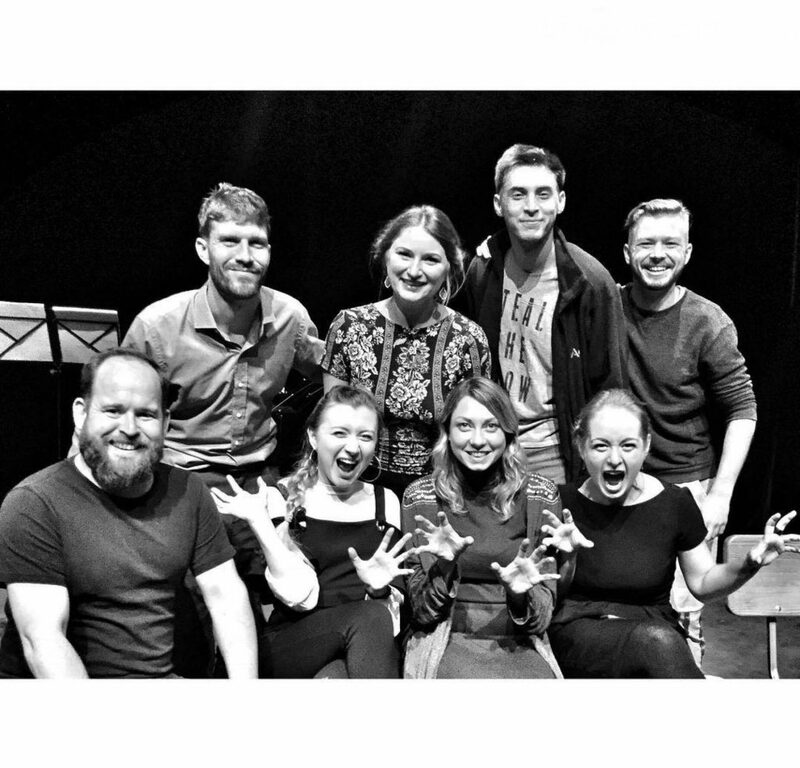 Pyretic Productions and the actors of Wild Theatre. Wednesday Oct 17th, was the presentation day at the Les Kurbas Centre in downtown Kyiv. After a quick battle breakfast Matthew and Lianna made some last final cuts and rewrites and then headed to the printers, while Patrick moved to the theatre to set the various lighting looks for the presentation. The technician at the theatre aptly named Dima (we met countless Dima’s throughout our time in Ukraine). 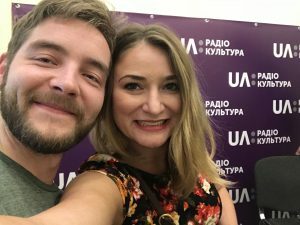 Dima didn’t speak a word of English – so Patrick would have been completely useless had it not been for the incredible Lera, a young director’s assistant at Wild Theatre, who acted as a translator and assistant to Patrick throughout the entire day in the theatre. Together the three of them managed to set the stage for the performance that evening. Shortly after the lights were set, Matthew and Lianna arrived with the fresh scripts. After a quick dress-rehearsal the team took a meal break and returned for the evening’s performance. 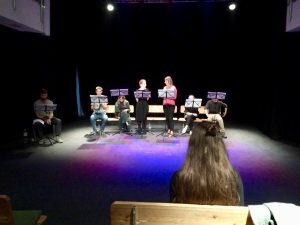 We were amazed with the response to the staged reading. The theatre was full. 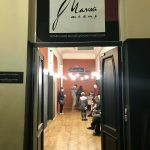 Our audience included several members of the Canadian Ukrainian embassy, veterans, social activists, Ukrainian theatre artists, and members of the general public. People intently listened throughout the reading, which was followed by a standing ovation. Pyretic Productions invited the audience to stay for a discussion and an opportunity for constructive feedback. Around 25 people stayed and engaged with our group. We discussed the impact of the story and its history. Many valid points were made, and questions were raised. And while we have had many similar discussions in Canada, it was enlightening to receive a “non-Western,” Ukrainian perspective on the subjects. We discussed ways in which the script was impactful to a Ukrainian audience, and ways in which it could use more refining. We discussed what it means to live day-to-day with an ongoing war in your country. Whether that means you have experienced it first-hand, or if it means you are living in peaceful parts of the country – which is the majority. That night we celebrated with our new friends: our cast, veterans from the “Bob Marley Squad,” and a few of the artists who came to hear our play. The last few days before our flight back to Canada we relaxed, and engaged in various meetings which in many ways continued the celebrations and invaluable discussions. 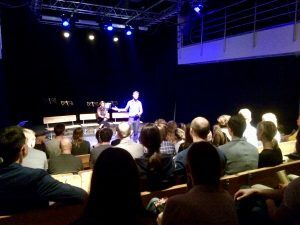 Our goals and ambitions with bringing a staged reading to Ukraine was to listen to Ukrainian perspectives, hear how the play resonated with the people, and integrate thoughts, opinions, and observations into the final script. We want to best capture and reflect the ongoing spirit and sentiments in Ukraine and its relationship to the ongoing war in its Eastern parts. Following the staged reading, we feel like we have achieved these goals. And we are overwhelmed with gratitude from the generosity of everyone who had helped us realize what we set out to achieve. We are confident that after another period of development in Canada, playwright Lianna, dramaturg Matthew, and director Patrick will have crafted a wonderful new Ukrainian Canadian play for our company to share with a Toronto audience. There are countless people to thank, and many of you will know who you are. 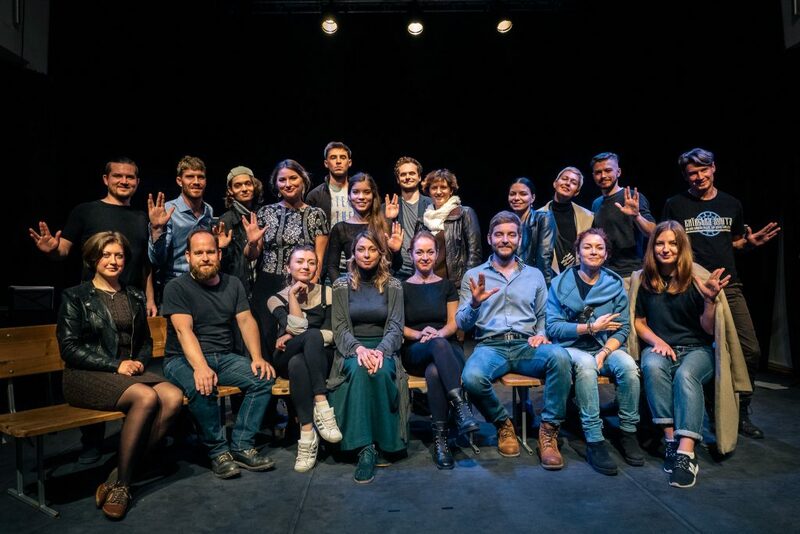 A special thank you to the wonderful actors for their work and dedication, Yaroslava, Roman, and Lera with Wild Theatre for their invaluable partnership, Les Kurbas Centre for hosting us, and Dmytro Lavrenchuk for making the connections and making it all possible for us. 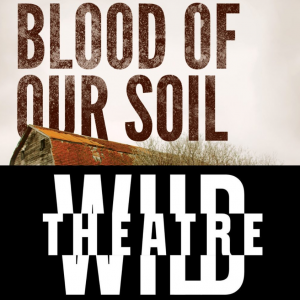 Blood of Our Soil will premiere in Toronto at the Tarragon Theatre. March 7-16, 2019. Stay tuned for when tickets go on sale, and for more exciting news. Join our mailing list to be the first to receive the news! Thank you for reading. And Слава Украіні!